And, what a great radio opportunity, Hoi! I agree with Heiwa on keeping it simple (KISS), FredB on no mention of any controlled op names (i.e. no negative distractions) & SmokingGunII about sticking to what we know and can demonstrate re video fakery (TV archives to verify), vicsims etc. I think referring listeners to Septemberclues.info for more on the subjects covered will achieve a lot more too. I was surprised by your mentioning "missiles", which I not only thought was a long abandoned "truther" hangout (e.g. Brianv's & Simon's post here) but frankly never made any logical sense to me for a media hoaxed, CGI movie event to disguise the demolition of buildings in what was obviously a totally contained & controlled physical area in Manhattan. Thanks Lux and Maat for the greetings! And yes, Maat - I would now definitely avoid any mention of my speculative AGM missile theory, as put forth in September Clues back in 2008. Whether right or (most likely) wrong, it is quite simply an unnecessary topic to mention/address in any presentation of our myriad of solid, collective findings. "KISS" is the way to go. I've always strived to simplify every aspect of this research - so I highly appreciate every advice and effort from everyone to "keep it simple". As Hoi rightly says, we are no media experts - but that doesn't mean we don't understand that communicating our findings has to be kept as sharp and simple as possible. I fully concur with the substance of the last paragraph of your above post, Maat. I'm impressed by how much (perfect) sense it makes. As I've told you on other occasions, I really do feel lucky to have you 'on board' here - and as an admin of Cluesforum at that! Happy Birthday and Congratulations, Simon! Thank you so much to you and the mods and dedicated researchers here, for all you do! Wow, thank you Simon! I feel truly privileged to be in the company of such brilliant minds on this forum (the best I've found anywhere) and was doubly honored when invited to be a member of your admin! simonshack wrote: 4: Demolishing the towers (behind a smokescreen) would be the easiest part of the operation. The major effort would be to impede any private imagery of that morning to emerge into the public domain. However, the military-managed control/evacuation of Lower Manhattan would have kept photo/videographers to a bare minimum, and electromagnetic jamming devices would have impeded any digital cameras to operate. Any damning imagery (in stark conflict with the TV imagery) captured by some John Doe would have easily been dealt with, as the Nutwork controls the media, the police authorities, and even the internet. Where could John Doe possibly publish/diffuse his damning images to the wider public? This feels like the weakest link. Not saying it's wrong, but we should expect some genuine amateur photos to be out there from 9/11. In the car, I always carry one of those ultra-cheap disposable cameras, in the event that the scene of an accident needs to be recorded. Those really cheap cameras with no flash are entirely mechanical, so there's no scope for jamming them electronically. It's difficult to understand how no one with a vantage point of the 9/11 Operation managed to obtain some genuine images with any type of camera. Although perhaps, as you've said, due to the perpetrators' judicious use of pyrotechnic smoke obscurants, no revealing images could be captured any way. Here's Wishing a Very Happy 5th Birthday to September Clues! Hoi, I'm quite happy to say I agree with every word of your last post responding to my suggestions! I also agree with SmokingGuns' and Maat's comments. I still don't like the idea of any call-in, even from Simon, or any off-the-cuff comments. I agree that reading all the SeptClues material would bog down and lose folks. We've got to go folksy and understandable to the casual listener. Move forward on this! And to all of us, Stay Free!!!!!!!!!!!!!!!!!! reichstag fireman wrote: It's difficult to understand how no one with a vantage point of the 9/11 Operation managed to obtain some genuine images with any type of camera. Although perhaps, as you've said, due to the perpetrators' judicious use of pyrotechnic smoke obscurants, no revealing images could be captured any way. Thanks for the 'birthday' wishes! Now, regarding the vantage point issue that you mention: Having lived on Houston street, a few blocks from the WTC (admittedly only for a month or so), I have extreme difficulty imagining what sort of vantage point any street dweller would have of the WTC towers - useful enough to snap any sort of (quote) 'revealing' (unquote) images of the events of 9/11. Add to this that the entire Lower Manhattan area was most probably pre-emptively cordoned-off/evacuated. But ok, let's say you were there and managed to snap some pictures that morning. Of what? What sort of picture would possibly be good enough to debunk/contradict/damningly expose the (purported) "aerial" chopper TV images of that morning? A picture of the WTC exploding - without an airplane? 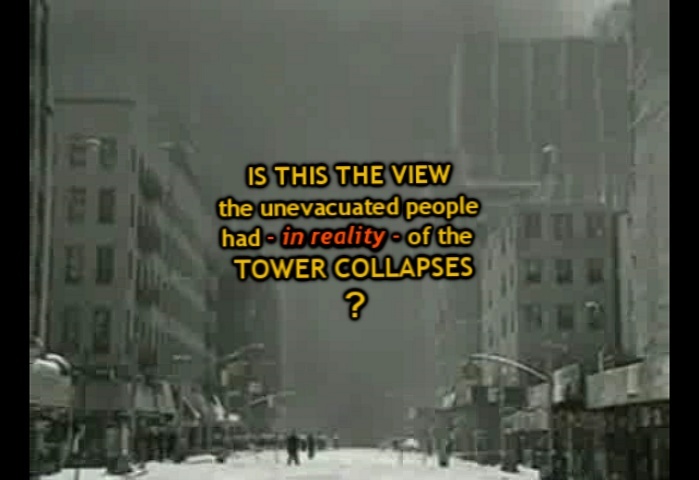 A clear picture of the collapsing towers, with some 'revealing' demo squibs and flashes? Nah. Hey I know I'm new and everything...but I hope you don't mind me sharing what I think could be useful to my fellow noobies. Anyhow, personally I have only limited experience with spotting digital forgeries - pretty much limited to the whole "terrible photoshopping" scandals of the fashion world, like the infinitely lulzy Ralph Lauren pictures...or the various Vlada Roslyakova fakes (like she wasn't skinny enough!). Through all that, I got familiar with the more obvious "tells" of photo doctoring, but going through this forum, I realize how much I still need to learn. Personally, I'd find a video, or video series on becoming a "photoshop detective" to be incredibly helpful. I think that if more people had the specific tools they needed to detect the forgeries you guys have found, it could really help your efforts, especially since it's not longer just them taking your word for it, but ACTUALLY detecting the fraud themselves. Anyhoo...just a suggestion...feel free to disregard. Our story does present questions - and I do want to address them. And I do think we have time. About the "missiles of some kind" and the "amateur photographs": I only have the testimony of one person who claims they saw something fly toward the towers. This - despite whatever smoke screen was at the towers - could probably not be faked. My guess is that - if they are not mistaken or lying - something flew into the smoke screen timed with an explosion. I will not insist that nothing flew but nor will I endorse any story that something did. We must leave it as ambiguous as that. It's the most scientific choice for me to mistrust this testimony of my friend and remain with the possibility that they were simply mistaken about anything flying. As for the "amateur photos", it is the onus of the photographers to present those. Since they don't seem to exist, they cannot be presented as evidence. I personally believe they would send spies to get close to people who took manual-shutter pics. I also think little of use would come from those pics except - as Simon has shown - a great deal of deliberate confusion and smoke. I don't think it's too much to ask that I mention both of these confusing things, as long as I am making it very clear why I sit on the fence of indecision. And why all of this still does not tilt in the slightest against the overwhelming proof of total 100% forgery. The manual photos and the missile idea are technicalities and we should mention that. The main culprit is the fake video and we should mention that, too. I think if we don't spend too much time on it, it's still KISS. But it shows we aren't total morons who refuse to look at dissenting doubts. Happy birthday Simon & September Clues, & thank you for your fantastic work! To celebrate, here is a special cake I found. MsQ wrote: Happy birthday Simon & September Clues, & thank you for your fantastic work! I believe both cakes pancake collapsed into their own batter, mere moments after this shot was taken. Grateful we are, for another million-to-one photograph! MsQ. I think your cake photo deserves a place in the "Art Corner" thread! SmokingGunII wrote: MsQ. I think your cake photo deserves a place in the "Art Corner" thread! I found it by googling "twin tower cakes". Annoyed though, as I just found some better ones under "9/11 cake"